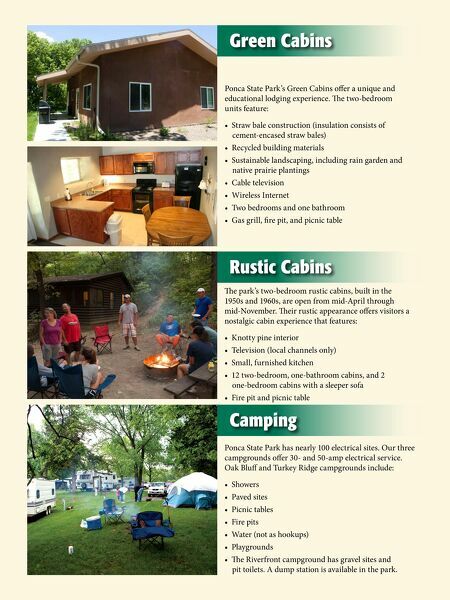 Ponca State Park's Green Cabins offer a unique and educational lodging experience. e two-bedroom units feature: • Straw bale construction (insulation consists of cement-encased straw bales) • Recycled building materials • Sustainable landscaping, including rain garden and native prairie plantings • Cable television • Wireless Internet • Two bedrooms and one bathroom • Gas grill, fire pit, and picnic table e park's two-bedroom rustic cabins, built in the 1950s and 1960s, are open from mid-April through mid-November. eir rustic appearance offers visitors a nostalgic cabin experience that features: • Knotty pine interior • Television (local channels only) • Small, furnished kitchen • 12 two-bedroom, one-bathroom cabins, and 2 one-bedroom cabins with a sleeper sofa • Fire pit and picnic table Green Cabins Rustic Cabins Camping Ponca State Park has nearly 100 electrical sites. Our three campgrounds offer 30- and 50-amp electrical service. 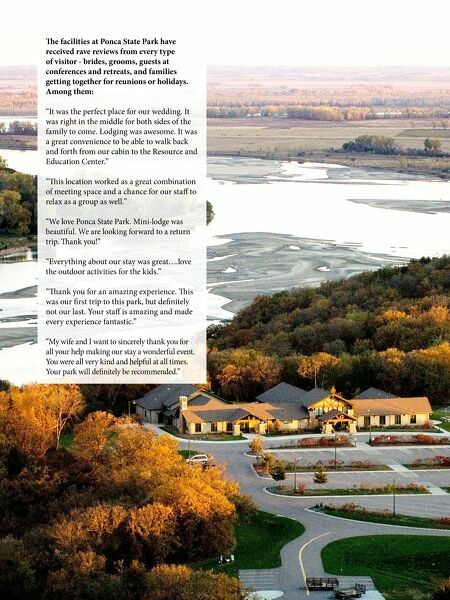 Oak Bluff and Turkey Ridge campgrounds include: • Showers • Paved sites • Picnic tables • Fire pits • Water (not as hookups) • Playgrounds • e Riverfront campground has gravel sites and pit toilets. A dump station is available in the park.